Is the world a hologram? This question has become a rather pat truism within the latest alternative paradigm; certainly since the publication of books like Michael Talbot’s Holographic Universe and Tales from the Time Loop by David Icke, the latter of which draws heavily on the former. But is this, if not premature, at least presumptive? What does all that actually mean? Do the people who so often talk about it really know? Descriptions of this fairly new idea have so far been described better in fictional allegory than scientific books, papers and documentary films. One very good example from cinema is Adrian Lyne’s 1990 chiller Jacob’s Ladder. I first watched this film after seeing it referred to in the excellent book The Spiritual Universe by Fred Alan Wolf. It follows the story of a troubled postman who is being haunted by demons as he makes his way though his everyday life. Mixed in with this are flashbacks to his former life as a soldier in the Vietnam War who is badly injured, and a father to a young boy who gets killed in an accident while riding his bike. As the film progresses it is revealed that the postman was actually killed in Vietnam and that the years of his life since have, it seems, all been a very long and protracted Near-Death-Experience in which his mental landscape formed his outer one. In a scene in which the postman’s friend refers to the 12th century mystical philosopher Meister Eckhart, he explained that the demons the postman perceived were really angels, but because he didn’t understand what they were he saw them as demons. Why is this? Why could one thing be another entirely different thing depending on our state of mind? This somehow struck a chord with me and I searched eagerly for any other information on the subject. Recently I’ve discovered another fictional allegory. It concerns both the work and the life of the writer Dennis Potter. I put the two words together because all of Potter’s best-known work was semi-autobiographical. Dennis Potter was born in 1935 in Berry Hill, Gloucestershire into a mining family. He began writing in 1965, but never achieved major acclaim until 1986 when the BBC broadcast the serial (What the BBC still rather snobbishly calls a “play”) The Singing Detective. This serial was a huge hit and catapulted Potter into the league of household names. The series was based on the story of a middle aged man who entered hospital to be treated for a bad case of psoriasis, a painful and irritating skin condition that causes sore dermatitis and itchy lesions. The main character was played excellently by Michael Gambon. (The show also contains yet another very negative portrayal of a Hospital Porter which I forgot to mention in this article! : http://hpanwo.blogspot.com/2008/10/hospital-porters-in-media.html A young black man who dowdily shunts the main character around whole chewing gum and listening to headphones. See: http://hpanwo.blogspot.com/2007/12/dont-tell-em-were-porters.html) During the course of his stay in hospital the character explores the world of his memory, drifting back to his childhood in the Forest of Dean, and also a fantasy world he’s created for himself because he’s a writer. 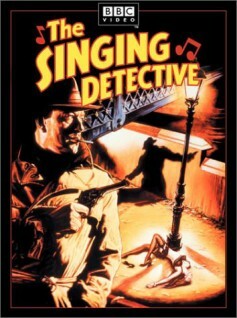 As the title suggests, his principle protagonist is a detective who is also a singer; he wears a trenchcoat and trilby hat making him a cliché Chandleresque private eye. The two mental landscapes are blended, with the effortlessly-apt and ingenious wit and style, with the real world of the character, that is Potter’s hallmark. At times, the different worlds become blurred, with characters in the real world acting out scenes from the main character’s fantasy or past. The narrative is accompanied by period popular music, another recurring feature of Potter's drama. His main character, as always, is somebody just like himself: a man of the same age, profession and with the same thoughts and feelings. Like his character, Potter originates from the Forest of Dean. In this way he is not dissimilar to my friend and fellow writer Jude Calvert-Toulmin, see: http://hpanwo.blogspot.com/2010/12/heroine-for-internet-age.html . We see this pattern continue in his subsequent serial Lipstick on Your Collar, which was broadcast in 1993. The story is set in England in 1956, on the verge of the Suez Crisis, and the main character in this series was a young man played by Ewan McGregor who is doing his national service as a Russian translator in a British military intelligence office. Again this matches with Potter’s own youthful experience as a Russian linguistic expert at around the same time; and the imagery of the series inspired me to envisage the “WL lab” in my own novel Evan’s Land: http://hpanwo.blogspot.com/2010/11/evans-land-online.html . This series also included some revolutionary computer-generated special effects. This was the last of Potter’s work that was produced during his lifetime. In 1994 Dennis Potter died of pancreatic cancer at the age of 59. True to form, he managed to complete a screenplay before his death, his most brilliant in my view. This was produced after he died in a unique collaborative effort between the BBC and Channel 4. It was a two-part series; the first called Karaoke and its sequel Cold Lazarus. Like all Potter’s work his two last plays are typical of his house style: hardbitten, gothic, surreal and darkly humourous. Potter was described by Alan Bennett and his other peers are rather arrogant and incapable of self-criticism. That’s true! But I sometimes think that a certain amount of arrogance is a good thing in literature. It can drive us to achieve excellence, as we define excellence on our own personal terms and this adds colour, richness and variety to the World of Letters. There are many great artistic geniuses who were arrogant to the point of megalomania, but I bet their work wouldn’t have been half as good if they’d felt the need to pander to “Duh Cwitticks” (I have a lot to say on that subject! See: http://hpanwo-voice.blogspot.com/2008/06/critics.html). If anything I’d say that most writers are not arrogant enough! They’re too eager to please the fickle readership and compromise their uniqueness to the mediocrats of cultural conformity. Another thing I like about Potter is that he refused to bow to Political Correctness; this brutal regime has blunted the literary and performing arts, especially comedy, for several decades now, and it has and bred a climate of fear that is virtually Orwellian in scale; and it’s about time dramatists stood up to it! The main character in Karaoke and Cold Lazarus is once again the author personified into the story, a man in his late fifties, emotionally troubled and with many physical health problems, the worst of which is the pancreatic cancer that eventually kills him. Karaoke follows the fortunes of a writer, Daniel Feeld, who is working on a TV production of one of his screenplays and he’s played very well by Albert Finney. Feeld finds himself being surrounded by people, total strangers in pubs, passers-by on the street etc, whom he overhears reciting lines of his play in their ordinary conversation. Feeld is bemused and starts questioning his own sanity. He tries to explain what’s happening to his friends, but they don’t believe him; they say it’s a “coincidence” (That word so beloved of Skepperhood, see: http://hpanwo-tv.blogspot.com/2010/08/its-just-coincidence.html) or that he’s imagining things. This element of the story is soon overtaken by Feeld’s quest to protect a young woman, who reminds him of his first love, from a brutal gangster who owns the sleazy bar in which she works. Potter’s typical blend between fantasy and reality means she also resembles Feeld’s character in the TV show he’s involved with. In the final scene, Feeld shoots the gangster dead and then returns to the hospital before the police can catch him. Karaoke ends with the mystery of Feeld’s strange experiences unsolved. It is only when you watch Cold Lazarus that you find out, and this is where Jacob’s Ladder and the Holographic Principle comes in. Cold Lazarus is a cyberpunk-ish dystopian sci-fi drama set in the 23rd Century. It turns out that when Daniel Feeld died all those hundreds of years earlier his friends had his head preserved via cryonics, a subject I wrote about on HPANWO long ago: http://hpanwo.blogspot.com/2007/08/cryonics.html A group of scientists led by a character played very enigmatically by Frances de la Tour have achieved the technology to regenerate Feeld’s cryonically-preserved head and tap into the memories stored inside his brain. They watch episodes of Feeld’s life played out before them rather like a TV show. Some of these involve his childhood in the Forest of Dean in the 1930’s, again just like the author. Others are scenes from his adult life, including the time period covered by Karaoke. A couple of the memories are very harrowing, including an incident as a small child where he is sexually-abused by a tramp in the woods. Others are happy memories, like when he met Beth, a girl he falls in love with and who is played by the same actress, and therefore meant to resemble, Sandra, the girl Feeld shelters in Karaoke. Feeld’s memory of his own death involves a classic Near-Death Experience in which he has an Out-of-Body episode and then goes up a tunnel towards a bright light. Then you hear Feeld scream in distress and he is pulled back down the tunnel and soon the truth becomes clear: Feeld is aware of his situation and is attempting to communicate with the scientists; he is suffering extremely badly and he asks that he be allowed to die. “We’re not studying him, we’re torturing him!” is a good line from the serial. In the end the scientists agree and destroy the laboratory and Feeld’s head; this is just before a media mogul manages to get hold of it and broadcast the memories on his TV channel. This is where the truth behind the enigma of Karaoke becomes clear and this is why it’s like Jacob’s Ladder. Daniel Feeld’s experiences in Karaoke are actually not real memories, but a world based on his memories, but constructed out of his imagination. The setting of Karaoke is not what it appears to be; it is actually taking place inside Feeld’s frozen head in the Lazarus laboratory in the 23rd Century. The way people keep reciting lines of his play is because they exist purely in Feeld’s imagination. This is exactly the same as the postman in Jacob’s Ladder. The reality of both the postman and Feeld in the two separate films is a mental construct, a very long Near-Death Experience. Both films end with the characters realizing their situation and finally dying for real... But when you examine the themes of these works you have to ask: What is real in the first place? The mind boggles! What if my experience now, sitting in front of a keyboard writing this article, is just taking place inside my mind. I might at this moment actually be a severed head on a laboratory bench in some distant future world. What if the scientists probing these memories I’m experiencing now are just the same, living a constructed life? And so on into infinite regression. This concept has elements that can be found in the very famous film The Matrix. As Morpheus says to Neo: “What is real? If you define “real” as what you can see hear, taste touch or smell then “real” is merely electrical signals from your nerves interpreted by the brain.” According to the physicist Frank Tipler we may well actually all be computer programmes living in a vastly complex virtual reality machine created by super-intelligent beings from the very distant future, see: http://www.youtube.com/watch?v=ialY2PgUIKI . The Holographic Principle is one that mainstream physics is only just beginning to come to terms with, but has been discussed by fringe researchers for some time: That everything that makes up reality has a structure that resembles an electronic construct. According to many writers, most recently Anthony Peake, see: http://www.anthonypeake.co.uk/index.php, this can explain phenomena like deja-vu and Synchronicity, something we're all familiar with and I've written about them myself many times. (EG: See my report on Brian Halliwell's speech here: http://hpanwo.blogspot.com/2008/10/uk-probe-conference-october-08.html) Recently, especially in the 1990’s, films were produced that explored this concept through fictional allegory, along with scientific books like Michael Talbot’s The Holographic Universe. Dennis Potter’s Karaoke and Cold Lazarus are two of these fictional allegories, less well known than The Matrix, but deserving of the same attention. Like George Orwell feverishly typing away at 1984 in his lonely Scottish island cottage, Potter left us a taunting and intriguing legacy before he left this Holographic Construct... or did he? Enjoyed the article. I am a big fan of Potter. All the best & have a good holiday! when you focus on something you make it real....simple really but nobody seems to get it ! It's great to see that you can watch Dennis Potter films on you tube. I hadn't thought of that. I think it changed television. Potter's ideas have been copied but none so good as the original. You're welcome, Barbara. Hope you enjoy them.